Castle Vardulon: What's that? More Simpsons Things I Noticed? 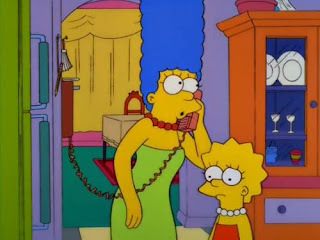 In the Simpsons episode 'Sunday Cruddy Sunday', better known as 'The Other Super Bowl Episode', Marge and Lisa have a subplot while the boys are off dealing with all that football mishegoss. They have some trouble with a Vincent Price-approved egg-decorating kit, and call a hotline, where a recording of Price leaves a very confusing message. What's so odd about this? At the end of the sequence, Lisa asks Marge to clarify whether Price is alive or dead. Which is a good question to ask, based on the convolutions in the message. Except for one thing - Lisa didn't hear the message. The entire time Marge was on the phone she held the handset up to her ear, while Lisa stood nearby. So how did Lisa know what was being said?